An early start to 2017, here are some personal achievements at Donair Flying Club. We congratulate members in reaching these milestones and wish them further success and safe flying in the future. 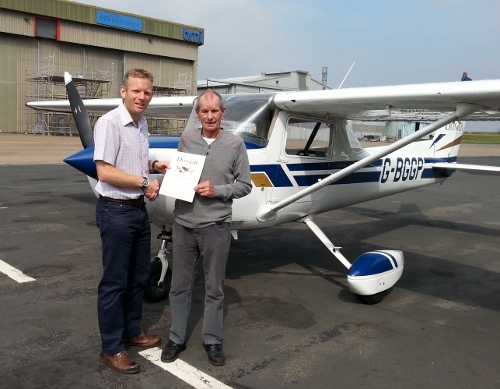 Congratulations to club member John Treece who flew solo today for the first time in 38 years! John last flew solo on his Private Pilot's Licence in 1977. 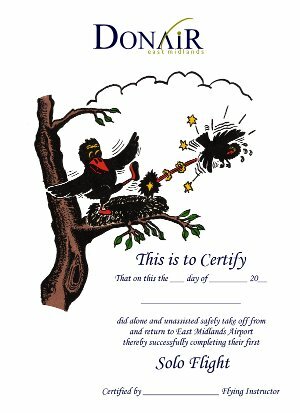 Over the last couple of years John has been working to regain the privileges of his licence which he gained in the early 1970's. 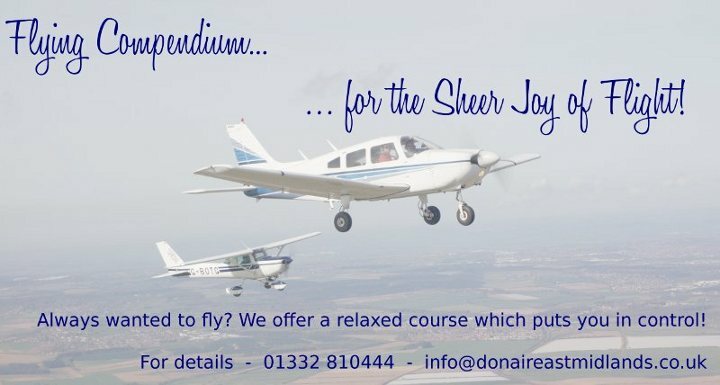 John's first solo flight in the 1970's was from the grass runway at East Midlands Airport, the grass runway has long since disappeared and today John has to share the skies with Ryanair and Jet2. 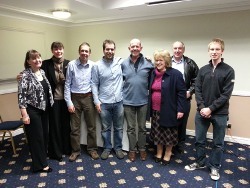 We wish John all the best for his upcoming skills test. Congratulations to all students who Flew Solo for the first time in 2015! Congratulations to all students who have been awarded a Private Pilot's Licence in 2015! 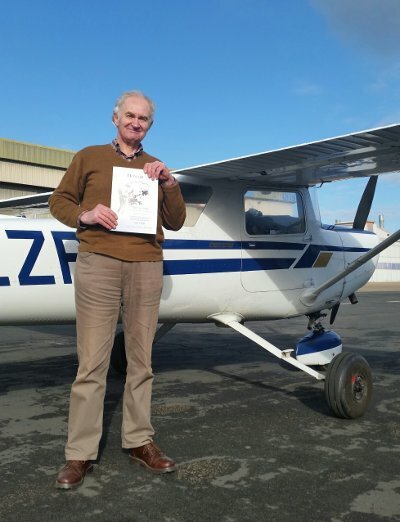 It was an anniversary to remember for Ken Hawkesworth when his wife, Elaine, surprised him with a flying lesson at Donair Flying Club at East Midlands Airport on Friday. It was 50 years ago that Ken and Elaine were married in Derby where they have spent their married life together and Elaine wanted to mark the occasion with something special. Although the couple fly regularly to their holiday destination this was the first time Ken had flown in a light aircraft. His Instructor, guided Ken to fly the aircraft over the Derbyshire countryside including Carsington Water and Chatsworth House. Pictured back on the ground at Donair is Ken with his Instructor, Dan. Everyone at Donair wished Ken and Elaine a very happy anniversary. Congratulations to all students who have Flown Solo for the first time in 2014! This list will be updated when new students take to the air. If we have omitted anyone please let us know. Congratulations to all students who have been awarded a Private Pilot's Licence in 2014! This list will be updated when new students take to the air. If we have omitted anyone please let us know. Congratulations to all students who have been awarded a Night Rating in Winter 2013/14! This list will be updated when new students take to the air. If we have omitted anyone please let us know. Congratulations to all students who have been awarded a Multi Engine Piston Rating in 2014! 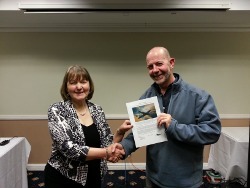 Congratulations to all students who have been awarded a Flight Instructor Rating in 2014! 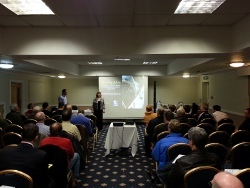 Over 70 pilots and student pilots attended a Safety Evening at the Kegworth Whitehouse Hotel on Friday, 11th January. The evening had been organised by Donair Flying Club and attracted pilots from not only East Midlands Airport but also from Tatenhill, Netherthorpe and Coventry. 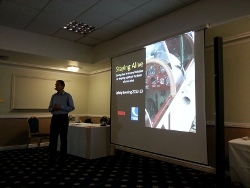 The presentation was given by Nils Jamieson from the General Aviation Safety Council (GASCo) and focused on Pilot Awareness: light aircraft cockpit management, pilot skills, weather and pre-flight planning, performance limitations, take-off, en-route flying and landing. Mr Jamieson flies for a commercial airline for a living and, in his own words, "anything I can get my hands on" in his spare time and this experience and obvious enthusiasm for all things aviation made for a very thought provoking and interesting evening. The evening concluded with a raffle with prizes kindly donated by East Midlands Airport, Pooley's Flight Equipment and Airplan Flight Equipment. There was an auction of a limited edition print "Spitfire Solstice" signed by the artist, Mark Postlethwaite and donated by Rolls-Royce PLC which realised £70 making a total of £242 raised on behalf of Rainbow's Hospice in Loughborough.